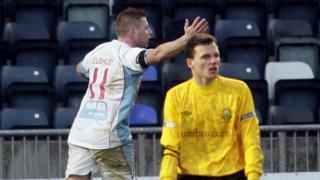 Two late goals from David Cushley earn Ballymena a 2-2 draw against Linfield in the Irish Premiership game at Windsor Park. The winger struck in the 71st and 83rd minutes to seal a point for the visiting Sky Blues. Goals from Matthew Tipton and Brian McCaul either side of half-time appeared to have put the league champions in control.